All rental items are subject to 1/2 down at the time of booking, this amount will go toward the rental price and is non-refundable. is due upon booking your order. There is a refundable damage deposit of $100.00 to rent tables. 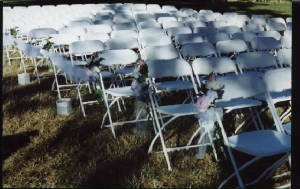 $75.00 refundable deposit on return of chairs. Exclusively Bridal has a beautiful outdoor dance floor. Customized design by David Cooper with a metal rod base. Great for outdoor functions! The floor is 15' by 15', solid wood, custom designed to suit most outdoor functions. Both a $37.50 non-refundable deposit and a $75.00 refundable deposit are required. There are three sections each of which is 8'.